Team Trump Scrambles to Avert "Oil Disruption"
Uber’s latest nosebleed valuation… the “false economy” under both Obama and Trump… Canadian cannabis, lightly taxed… and more! Crude remains above $70 a barrel this morning. The national average gasoline price, according to AAA, is $2.88. Both figures have backed off their levels of a few days ago… but both are way elevated compared with a year ago. Then, crude was fetching $52 and a gallon of regular unleaded was $2.47. And that’s the reason the apparent murder of the Saudi Arabian journalist Jamal Khashoggi will get swept under the proverbial rug. The cover story from the Saudi regime has begun to take shape in the last 24 hours, and Donald Trump is giving it credence: “Rogue killers” within the government were interrogating Khashoggi, and doggone it, they juust went a little too far. For all we know, it’s true. Within every regime, there are competing power centers. And in the case of Saudi Arabia, we’re talking about a kingdom that maintains two armies — so that if one rises up in rebellion, the other can put it down. Exactly. JPMorgan Chase CEO Jamie Dimon and other hotshots have pulled out of the annual “Davos in the Desert” event sponsored by the kingdom later this month. But once next year’s event rolls around, the fury will have blown over and it’ll be all handshakes and smiles again. As for the Trump administration, the Khashoggi case is proving a mighty distraction from the renewed sanctions on Iranian oil exports, due to take effect in less than three weeks. The attention focused on Khashoggi “could derail a showdown with Iran and jeopardize plans to enlist Saudi help to avoid disrupting the oil market,” writes reporter David Sanger at The New York Times. The biggest concern is about pressure from Congress for sanctions against Saudi Arabia. 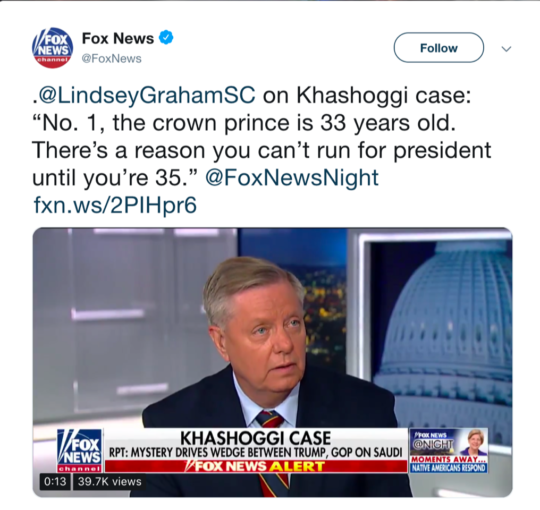 Case in point: Sen. Lindsey Graham (R-South Carolina). He has Donald Trump’s ear, he’s a longtime Iran hawk and he’s a longtime backer of the Saudi regime. But the Khashoggi killing is a bridge too far for him, and he pins the blame directly on Crown Prince Mohammed bin Salman. “I’m not going back to Saudi Arabia as long as this guy’s in charge,” he said yesterday on Fox & Friends. They need not fret, though. As Greenwald says, the “rogue killers” story will give both Trump and the Establishment the cover they need to carry on business as usual with Saudi Arabia’s (literal) cutthroats. Lindsey Graham will climb back aboard. Washington and Riyadh will come up with some arrangement to pump enough oil to make up for the loss of Iranian exports. The major U.S. stock indexes are giving back a small amount of yesterday’s monster gains. At last check the Dow has coughed up about 100 points of the 550-point leap yesterday — a loss of about a third of a percent. The S&P 500 and the Nasdaq are holding up better. Wall Street banks are valuing Uber as high as $120 billion once it goes public early next year. That’s nearly double the company’s valuation based on a fundraising round two months ago — and clearly discounting the notion that Uber’s valuation relies on a Ponzi scheme. Gold is holding onto its gains of recent days at $1,226. If history is any guide — and admittedly, it’s not always — the stock market is set to bounce still higher after the fright of last Wednesday and Thursday. Our resident “quant” Jonas Elmerraji is also a fount of fascinating market data. “Looking back over the past 30 years,” he tells us, “there have been 31 instances of the S&P 500 seeing two consecutive drops of 2% or more. Yes, there are caveats: “For instance,” says Jonas, “it’s rare to see sharp corrections like this when stocks are near record highs. Typically, clusters of big negative price moves happen in bear markets. Then again, the S&P went through an even bigger shock correction in August 2015, only to surge double digits in the months that followed. “The S&P is up 54% since then,” says Jonas. We’ve been tracking the trend of countries overseas transacting in their own currencies rather than dollars for years now. We first noticed Russian media using the term “de-dollarization” in 2014. And we first noticed the term picked up by a major U.S. media outlet in August. Now it’s the turn of the Brits in the Financial Times, although it uses an alternative term we like just as much — the “weaponization of the dollar.” But the idea’s the same: Washington’s constant imposition of sanctions against countries it doesn’t like is driving those countries to walk away from the dollar. The practice “has not only incurred the wrath of China, [but] it is increasingly alienating government officials and politicians in Europe, the Middle East and Asia as well as infuriating some bank executives,” writes FT columnist Henny Sender. She was aghast to discover the Fed’s ultra-low interest rates in the post-2008 era had robbed American savers of $470 billion in interest income. Not that she cared about your pitiful returns on CDs… but she was deeply concerned for insurance companies and pension funds that were also getting pitiful returns on fixed-income instruments. Ms. Sender says a signal event came earlier this year, one that we were anticipating months in advance — China’s adoption of an oil futures contract denominated in yuan. China is nowhere near there yet. But the process is underway. 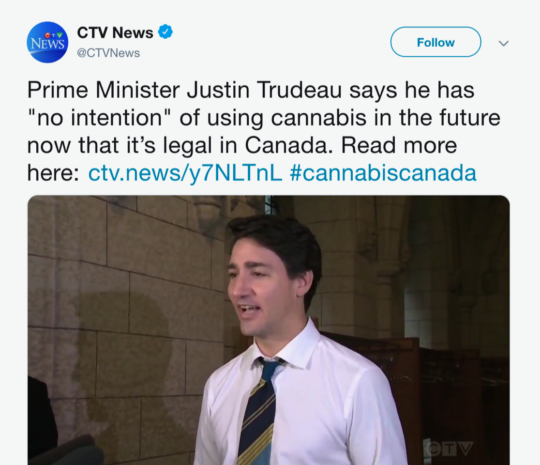 Recreational cannabis is legal in Canada effective today. And it’s lightly taxed compared with some U.S. states. Canada is the second country — after Uruguay — to legalize marijuana nationwide. The national government will collect a tax from the final producer of either 10% or $1 per gram, whichever is greater. That’s on top of sales taxes running between 5–15%. Altogether that’s a lower tax rate than in places like California and Washington state — where taxes are so steep that legal purveyors have trouble competing with the black market. P.S. Across America, people are discovering a strange device that can identify major market moves in advance. Wall Street pros have used a version of it for years. But now it’s available to everyday Americans too. You can watch it in action at this link. Please note that when you click, you’ll be asked to submit your initials on a nondisclosure form. That’s because the information revealed in the demonstration is highly sensitive… and for limited distribution to readers like you only. Here’s the link one more time.